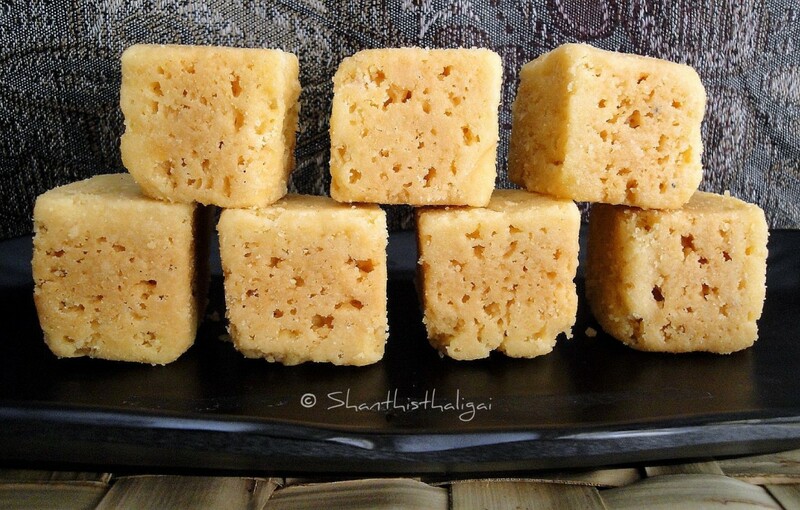 The traditional porous mysore pak is a melt-in-mouth sweet made during festivals, functions and marriages. When I was young, elders at home made these type of mysore pak only. Being in Coimbatore, I can still remember the days when Krishna sweets soft mysorepa (I mention it as mysorepa and not mysorepak) was introduced. Elders would say, "Mysorepagunna kara karannu vaaila potta karaiya vendamo? 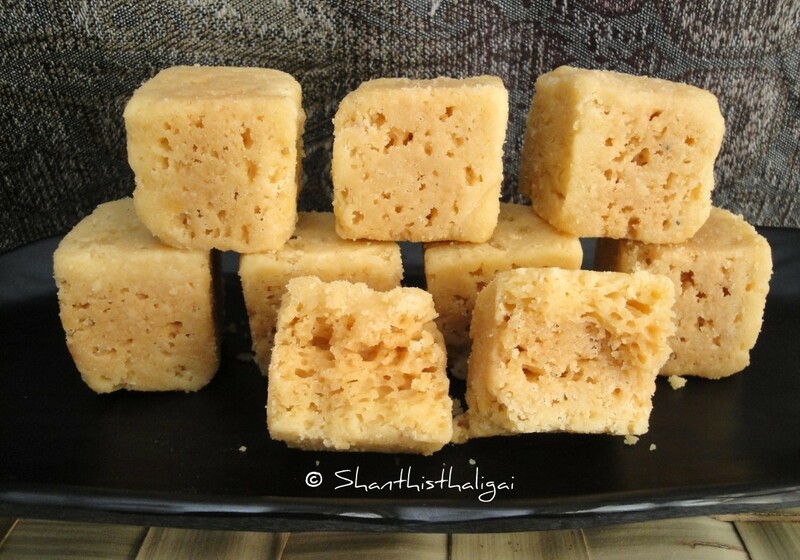 Ennamo po" i.e., Mysorepak is meant to be crunchy and melt in mouth instead of being soft. Krishna sweets mysorepa is known for its taste and easy making though. Grease a tray with ghee and keep ready. Sieve besan and keep it ready near the stove. (Some people dry roast besan). Take sugar in a thick bottomed kadai, add water, just to immerse the sugar and make sugar syrup for soft ball consistency. If you add a drop of syrup in a small plate of water, you should be able to roll it to a ball, without dissolving in the water or you can check the syrup with your index finger and thumb to get a thick, long one string consistency. 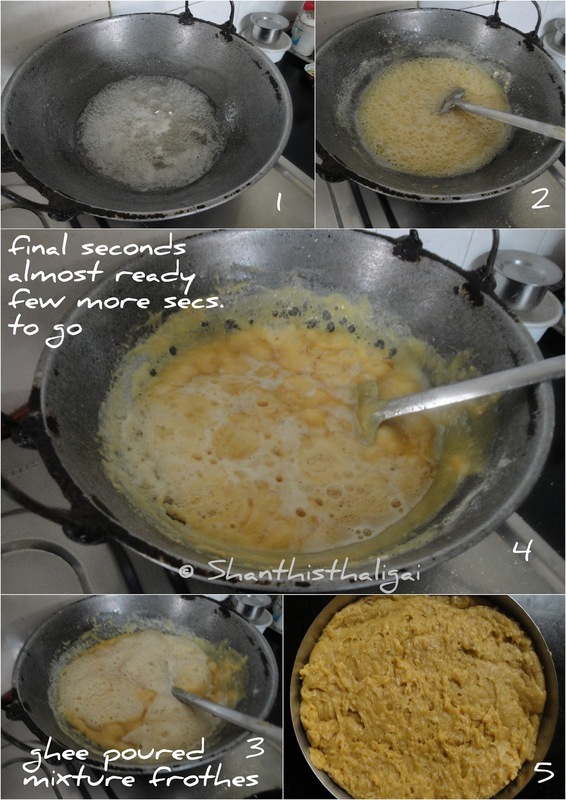 Meanwhile, melt ghee+oil mixture in another stove, in medium flame and keep it ready too. 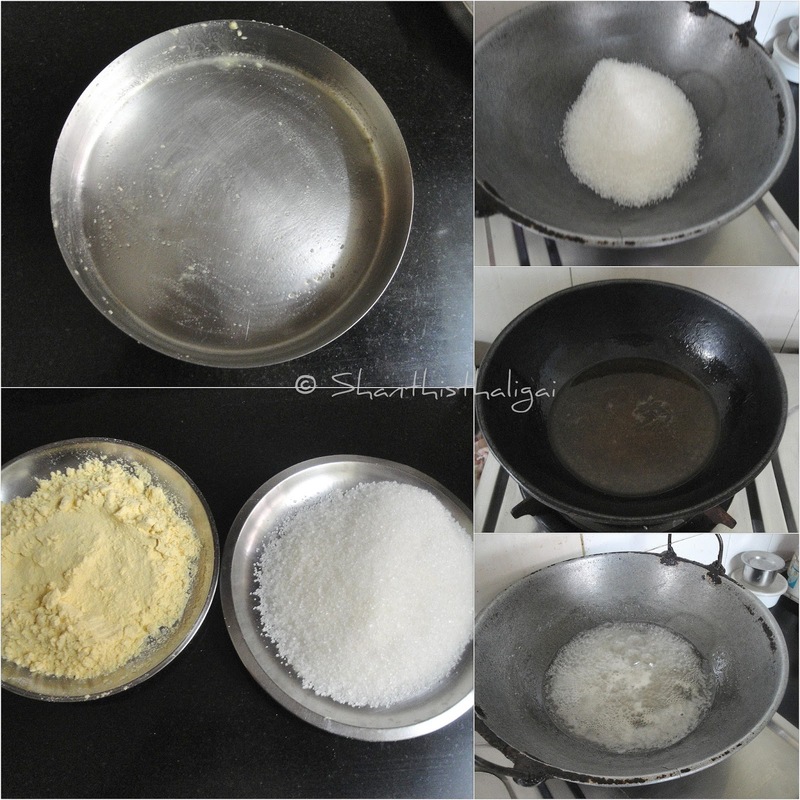 When you get the sugar syrup consistency, put the flour little by little in it, simultaneously add a ladle of hot melted ghee also and stir it non-stop without any lumps. Each time when you pour the hot ghee mixture, the mixture hisses and frothes and you can see air bubbles. Pour the ladle of ghee in such a way that it spreads all over the mixture.These bubbles finally turn into beautiful pores and makes the mysore pak porous. This is the secret of porous mysorepak. Stir continuously in medium flame. Repeat the process until besan and ghee is finished. When the whole mixture becomes frothy, leaving the sides of the kadai (need not become a mass) switch off the flame and quickly transfer the mixture to a greased tray. Just tap the tray to get a uniform surface. (Do not press with a spatula to even the surface). Wait just for a couple of minutes. When it is still hot, run a greased knife to get the desired shape. Allow it to cool and then take out the pieces. Wow... appreciate your patience in writing the whole recipe step by step with pictures. Thanks for sharing the valueble tips. How long did this recipe take aproximately AFTER you stated to add the besan flour, please ? That would also be a helpful tip. Thanks. What oil should be used?